The price of gold slipped to a two-week low in overnight trading Thursday ahead of the highly anticipated Brexit vote today. The upcoming Brexit vote will determine if the UK stays or exits the European Union, and it has been having a major impact on gold prices. 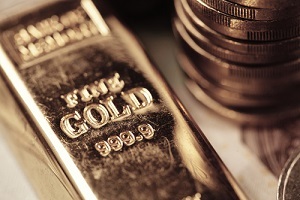 By midmorning, the price of gold today had pared earlier losses and was mostly flat. At last check, the spot gold price was down a modest $2.90, or 0.23%, at $1,263.10. Gold prices have continued to slip this week as new Brexit polls revealed UK voters have been leaning towards remaining part of the EU. Early Brexit polls today show "Remain" ahead by 51% to "Leave's" 49%, according to The Telegraph. London bookmaker odds show 80% of voters are expected to vote for the UK to stay in the EU. That growing momentum for "Remain" has sent stocks around the globe higher. The Stoxx Europe 600 jumped 1.4% in late morning trading Thursday, building on four straight days of gains. The British pound rose 0.4% against the dollar to $1.48, after hitting its highest level since December. The London FTSE 100 Index gained 0.5%. Shares in Japan and Hong Kong closed higher. U.S. markets were all comfortably in the green right out of the gate. The optimistic mood among investors that there will be no Brexit has been reflected in the market's fear gauge, the VIX volatility index. It dropped 13% today, which was its biggest drop in over a month. Polling stations opened at 7 a.m. (2 a.m. EDT) and will close at 10 p.m. (5 p.m. EDT). A record number of people, almost 46.5 million, are registered to cast ballots in the once-in-a-generation vote. Registered voters include Britons 18 and older from England, Wales, Scotland, Northern Ireland, and Gibraltar. In the run-up to the Brexit vote, with "Remain" gaining favor, the price of gold has dropped and volatility has spiked. Gold's 100-day historical volatility rose on Tuesday to its highest level since March 2015. London-based ETF Securities predicts the price of gold will rise by 8% if the UK votes to leave the EU. Societe Generale SA sees gold surging 10% to above $1,400 an ounce. If "Remain" wins, gold's volatility is expected to increase as investors who bet on gold prices gaining move to unwind those wagers. The increasing use of negative interest rates by global central banks, lower for longer interest rates in the United States, and a slowdown in China are just a few reasons to be bullish on gold prices in 2016. Earlier this week, George Soros warned a currency crisis could be coming in the event of Brexit. But he is wagering on a "Remain" win and has taken a large gold position. Soros has taken a stake in the world's biggest gold producer, Barrick Gold Corp. (NYSE: ABX), worth $264 million at the end of March. Soros acquired 1.7% of Barrick, making it his fund's biggest U.S.-listed holding. Despite this week's pullback, gold prices are still handily outperforming stocks. Gold prices are up 19.59% year to date. In comparison, the Dow, S&P 500, and Nasdaq are up 2.82%, 2.78%, and down 2.73%, respectively. I am hoping this is true!